There is no good and bad in the story of the Oklahoma City Thunder blowing a huge lead and a chance to finish the series. There’s one player – Russell Westbrook, who seems to be living inside a bubble; there’s another player, who happens to be Kevin Durant and the league MVP; and there’s a head coach called Scott Brooks who has some nice numbers and win-loss record, but doesn’t seem to have any idea on how to make adjustments or improve his team. Some things just don’t make sense: Four final possessions, and Kevin Durant doesn’t touch the ball once. He has scored 40 points by that point (1:35 left in the fourth quarter). He is the top scorer in the NBA. He is the regular season MVP. Yet Russell Westbrook doesn’t think twice about taking four shots (making two of them) without even looking to pass to his teammate who happens to be a better player. 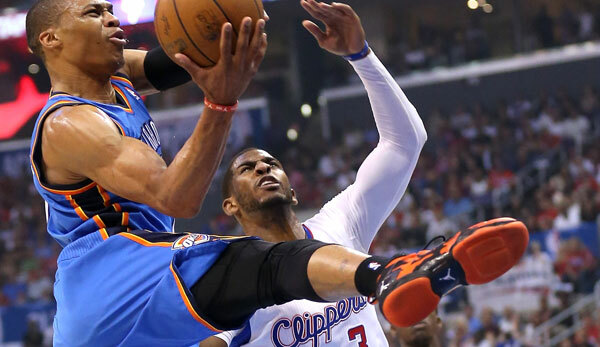 Scott Brooks has yet to come up with a way to get that out of Westbrook’s system. Kevin Durant isn’t “innocent” when it comes to his decisions in the fourth. After doing so well all game when trying to score inside he reverts to tough, contested shots from long range in the final quarter. Somehow, shorter, smaller players have the ability to get inside of him and make him feel uncomfortable. Tony Allen did a great job with that during the first round series, but it didn’t always work. 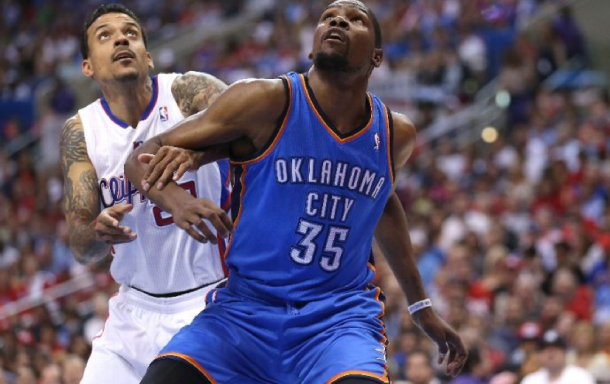 Chris Paul for a few minutes made Durant very uncomfortable in the fourth quarter. So what’s the way of fixing this? Three options, including one that’s extremely unlikely. One is Scott Brooks actually trying to teach his players some offense. It doesn’t have to be something complicated. Most NBA teams don’t have a wide variety of offensive players. But what differs good coaches from the regular ones is being able to convince star players to do stuff they don’t like. For example, making Westbrook, forcing Westbrook, to pass on at least one of those final possessions instead of making it about him trying to save the day. There’s the other option. Of hoping Westbrook learns from his mistakes. But that isn’t going to happen. When Westbrook is asked about these things after games he claims the media is out to get him or his teammates. That he knows, his team knows how to fix things. Sometimes they show that. But when the same mistakes keep on happening, you have to wonder what’s actually being done to rectify a situation that isn’t healthy for the team. There’s the third option: benching Westbrook. I honestly think that without him on the team the Thunder are better, but that also means bringing in other players instead. That’s more of a Macro view. It’s not something that can be changed now. But if Brooks can suddenly go small (which was a disaster, because he took out the wrong players), why not try some clutch minutes without Westbrook? The Thunder played their best basketball this season without him. This isn’t a case of Westbrook tearing the team from inside. He and Kevin Durant are friends, and Durant has Westbrook’s back. It’s a matter of coaching. Russell Westbrook isn’t going to change on his own, he needs to be directed into the right way. It’s not a point guard / shooting guard question. It’s about making the right decisions at the right time. You can call him a towel boy, it doesn’t matter. But right now the Thunder are dancing on ice. Talented on offense, more than anyone else, but with questionable play calling and decision making in the fourth quarter a recurring thing, while a head coach watches from the sidelines without doing a single thing to fix it.